Moderate due to length, some rocky areas. The Vin Gormley Trail in Charlestown is an 8 mile loop that traverses through a diverse terrain. A member of the Trails Committee of the Appalachian Mountain Club, John Vincent Gormley is a local hiking legend. Mr. Gormley spent countless hours clearing and maintaining trails in both the Arcadia and Burlingame Management Areas. In the 1980’s he started maintaining the yellow trail loop around Watchaug Pond. In the early 1990’s, the State of Rhode Island named this trail in his honor. The trail technically starts at the Burlingame Campground, however parking is difficult, if at all, and there is a fee to get into the campground during camping season. There is, however, a small parking area along Kings Factory Road where you can start the trail. Choosing this point for the beginning eliminates a good portion of the road walking first. From here you head south along Kings Factory Road, then turn right onto the Prosser Trail (a paved road). Soon you turn right again into the Burlingame picnic area. Stay to the left when you approach the information board and follow Sanctuary Road. The road soon becomes a gravel road as it approaches the Audubon Society’s Kimball Wildlife Sanctuary. 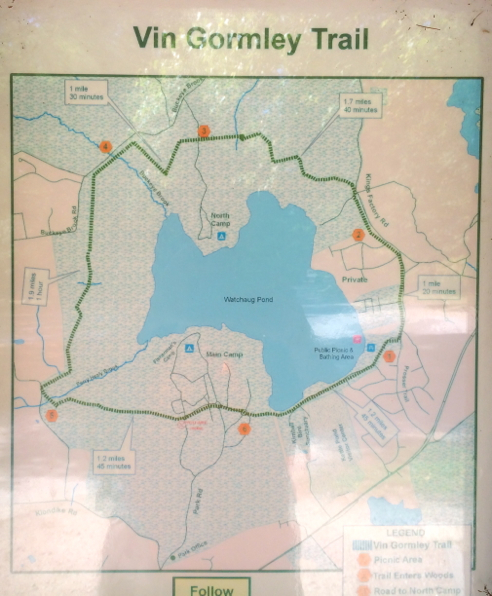 The Vin Gormley Trail then splits to the right off of the road and follows the south end of Watchaug Pond as it cuts across the Audubon property. There are several spur trails here to the right to catch a view of the pond. Continue to follow the yellow blazes and you will soon approach the campground. Stay to the right when you get to the playground and then follow the yellow blazes straight ahead of you through the campground. Soon you will approach and information kiosk about the history of the trail. At this point you have hiked 2.4 miles, the remainder of the hike (with the exception of a short 1/4 mile stretch) is on wooded trails. The trail meanders through the woods as it crawls over boardwalks and passes streams and stone walls. The Vin Gormley Trail is joined by the blue blazed North South Trail for several miles as well. 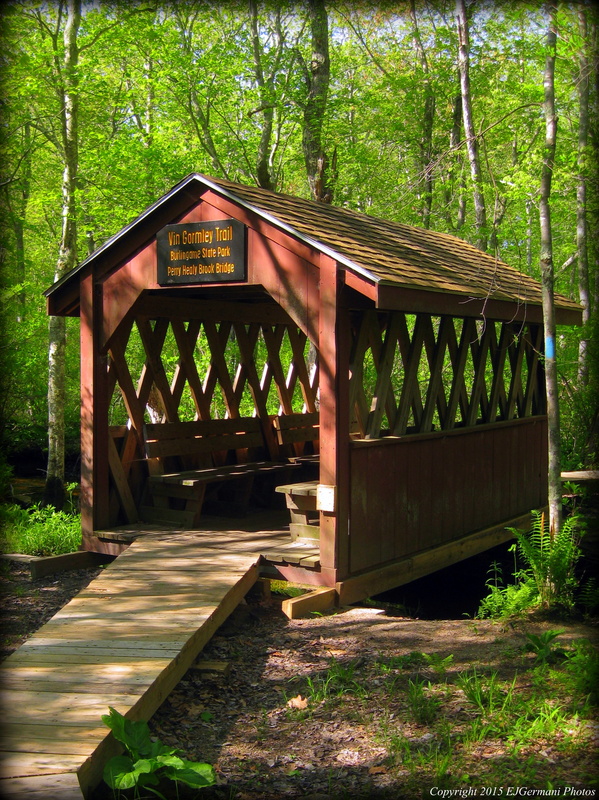 Where the trail crosses the Peary Healy Brook there is a covered bridge followed by a long stretch of more boardwalks. Continue to follow the yellow blazes northward passing several areas of ferns. When the trail comes out to Buckeye Brook Road, continue to follow the yellow blazes. You will be following the road a short distance before jotting back into the woods on the right once again. The last stretch of the hike continues to follow the yellow blazes crossing the access road to the former Burlingame North Camp. Continuing through areas of ledges and outcrops the trail becomes rocky. We concluded the hike at our point of beginning. The trails here are well worn and defined, however there are several trails that spur and lead off of the Vin Gormley. Be sure to keep an eye for the trail blazes at the trail intersections. Trail map can be found at: Vin Gormley Trail.